Firstly, there’s no doubt when we think of a helmet, we think protection. But we also think fashion, fit and functionality. However, overall the most important factor is safety. That’s where the new Specialized Prevail Helmet is positioned, not only offering protection but unrivalled safety features. The ANGi, which stands for Angular and G-Force Indicator is a new innovative sensor that will be featured on Specialized helmets. The new system looks to offer protection before, during and after a crash. Basically, the helmet is a live tracking device, crash detector and safety beacon. More importantly though the helmet, through its nifty ANGi Sensor, connects you to help when you most need it. The ANGi’s accelerometer and gyroscope measure both impact forces and harmful rotational forces, even if the latter isn’t caused by an impact, that may leave you with an otherwise undetected concussion. When the ANGi measures forces outside of what’s considered safe, your smartphone will sound an alarm, and if this isn’t cancelled, it will send an SOS text to your designated emergency contact. All this from a sensor smaller than your smallest multi-tool; technology! Embarking on my first ride with the new lid, I paired my smartphone to the Specialized Rider App. Which, it should be noted, you only need to do the first time; after that it will auto-connect to the app. First thoughts after fitting it on my noggin and dialing up the micro-dial fit system are that it felt good, however the helmet is a little bulkier than I’m used to. Specialized have opted to use MIPS for the first time and will now use on every Specialized helmet. This is a big statement. They have also introduced MIPS SL which will be fitted to their higher end helmets, such as the Prevail II. As the name suggests, its super-light and when worn on my initial rides with the helmet, it does feel very comfortable. This is exclusive to Specialized. The clever folk at Morgan Hill have integrated MIPS within the helmet padding itself, so it feels and acts as part of the helmet but with the same benefits. Another feature of their MIPS system is the minimalist ‘watchband’ attachment system which provides 10 to 15mm of rotation in every direction. More in-depth ride testing coming soon. For many of us, cycling is our escape, thanks to its fundamental simplicity. Cinch up your helmet, clip into your pedal and push off; once we’re rolling, we’re free. We accept the risk of darting in and out of traffic and ride worry free because we love it, but that’s not to stop our loved ones from worrying. The key benefit to ANGi is that it not only gives us peace of mind, but it gives those who matter to us, peace of mind too. Subscribe to our print edition for full review and the best of New Zealand Cycling. Bontrager's new Velocis is a race-worthy lid for all occasions. 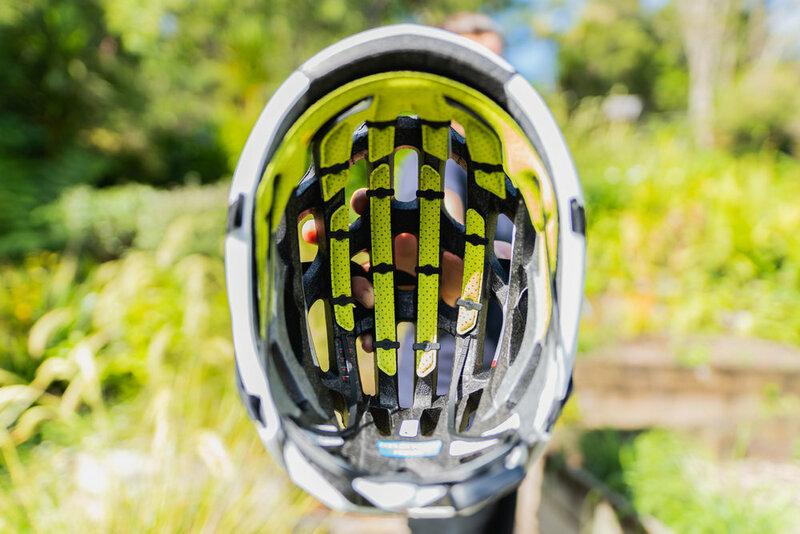 We review the Bullet helmet by Lazer.